It's fair to say that I really like chocolate. What you may not know about me is that my undergraduate major was biology with an emphasis on evolution, ecology, and conservation biology. Given these two facts, you could probably guess that I was enthusiastic when asked to review several bars from Endangered Species Chocolate. 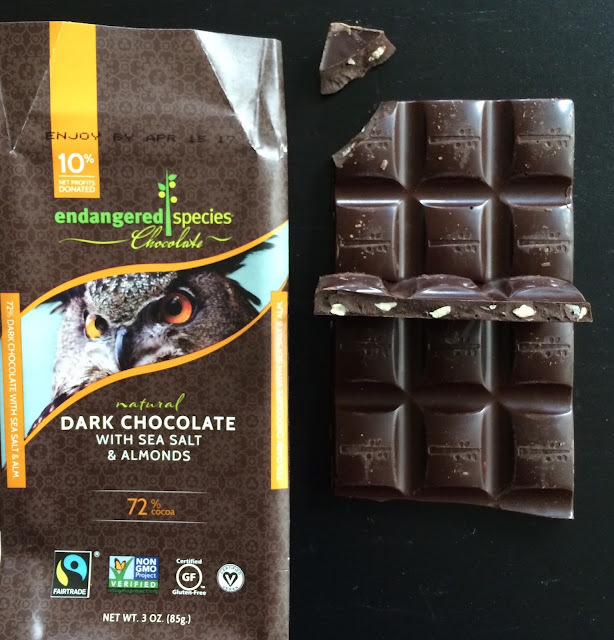 The company uses not only uses "ethically traded, shade grown cacao and natural ingredients" in its chocolate bars but 10% of its net profits donated to wildlife conservation projects. The current project partners are African Wildlife Foundation and The Xerces Society for Invertebrate Conservation. The AWF has many projects; as a fan of giraffes, it was bittersweet to read about the organization's conservation strategy for the endangered West African Giraffe. One of the main foci of The Xerces Society is pollinator conservation, think bees and butterflies. I tasted three chocolate bars, all dark at 72%. They are (in order of tasting): the Wolf (properly the Gray Wolf), dark chocolate with cranberries & almonds; the Bat (the Marianas flying fox or fruit bat), dark chocolate with cacao nibs; and the Owl (the Eurasian eagle owl), dark chocolate with sea salt & almonds. My favorite is The Owl. The chocolate itself is smooth with bright fruit notes and is well complemented by the salt and crunch of the almonds. The Bat surprised me. Typically I experience chocolate bars blended with cacao nibs as gritty and bitter. The presence of the nibs in this bar did not negatively affect the texture and imparted a dark fruit flavor to the bar. I've gone back and forth on the Wolf. I didn't taste any of the cranberry tartness I was expecting. This bar was the driest of the bars; it had the least creamy mouthfeel. I think I would use the Wolf in a recipe but eat the Owl and the Bat on their own (or paired with tea!). Do you consider the environmental and labor stances of a company when purchasing chocolate or other foods (and beverages)? Chocolate bars provided for review. P.S. Two of my favorite articles for pairing chocolate and tea are were written by Jee of Oh, How Civilized and Rachel at Buddhists Who Shop. Thank you for tasting our chocolate! And for posing the question about environmental and labor practices behind the foods we all choose. Choosing Fair Trade certified tea and chocolate allows farmers and workers in developing countries to have more power to determine their futures and enjoy sustainable livelihood. Cheers to that! I really appreciate your comment on the review. It was a pleasure for me. Thank you!